The creation, including the earth, is not to be well treated because it is sacred or because it should be worshiped, but because God made it and called it good (Genesis 1), and its goodness is independent of human utility. Caring for the environment is a moral issue. How we interact with the world around us, not just with other people but with the stuff of the earth, is not a matter of right, but of responsibility. That, at least, is the premise of the book Redeeming Creation, coauthored by Fred Van Dyke, David C. Mahan, Joseph K. Sheldon, and Raymond H. Brand. The authors believe that without a solid ethical foundation underpinning our behaviors, as well as the policies put in place to police these behaviors, we'll find that we're talking one way and walking another. The book explores various ethical foundations that have been proposed to support environmentalism, then proceeds to test those foundations as well as the logical end points that they lead to. They conclude that the only solid ethical construct is one which includes God as creator, sustainer, and redeemer. Ethics -- do we Value ecology? Theology -- where's God on ecology? 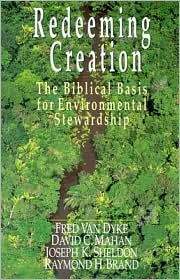 Believing that a Biblical view of God is at the heart of a sound ethic regarding ecology, the authors proceed to flesh out the theology that underpins that ethic. Much of what they have to say carries a distinct flavor of Schaefferian thought (as outlined in Francis Schaeffer's book, Pollution and the Death of Man). The authors neatly and clearly flesh out several ideas that Schaeffer comparatively only glanced across: God is transcendent, God has called all creation "good" (thereby giving it value), humans are inseparably linked to creation, mankind is fallen (and this affects creation), and God has made a covenant of redemption not only with mankind but with all of creation. Though many ancient creation stories tell of gods who fashioned the earth out of the stuff around them (or in some cases, out of the flesh of other gods), only the Hebrew God created the world out of nothing that had existed before. He remains separate from creation (transcendent), and creation gains value not because it is made of the flesh of god, but because God said it was "good." God ascribed value to creation. God said each part was good. But God has brought about a new covenant, one that not only brings healing to humans, but to the earth as well. God is redemptive and though the Bible is very clear about the redemption brought to mankind, it is also clear that, "God was pleased to reconcile to himself all things, whether on earth or in heaven, by making peace through the blood of his cross." (Colossians 1) And, the authors point out, God has called his people, who he has redeemed, to be agents of redemption themselves, not only to other people but to all of creation. As stewards of God's creation, they are not to abuse the land and its inhabitants, but as Jesus washed the feet of his disciples, exemplifying for them a servant leadership, so too are God's people to be servants of God's creation, caring for it as stewards for its true owner. In order to recommend a response to the environmental ills of our age, the authors first described the problems at issue. They organized these into three main categories: 1) population, 2) consumption vs. sustainability and 3) pollution and waste -- the second two being aggravated by the growth of the first. They explore the Biblical record, the historic record, and the evidence we can see today, all of which point toward mankind being behind many of the ills under which the earth currently groans. And we also suffer, along with the rest of creation, as a result of these ills. The consequences are ecological, medical, economic, cultural, and aesthetic. The authors are firm, clear, and concrete in their arguments. They're honest about some of the abject failures that the church has perpetrated upon the environment, but they are of great hope that only a sound Biblical ethic can address the environmental problems that humanity faces in this day and age. Meg, one of the things with which I struggle is that the earth is temporal, according to the Bible. Man is to have dominion over the earth, according to Genesis, and to be a steward of the resources God has given. Being a good steward does not mean abusing and wasting but it also does not mean that the earth is more important than man or God. That being said, I think much of the environmental movement is incompatible with Orthodox Christianity and here's why: They worship the creation rather than the Creator. The Apostle Paul addresses this in Romans chapter one. At any rate, thanks for the thought provoking entries. Just because much of the environmental movement worships the wrong thing (and I think I'd actually differ with you there. I think a lot of people join environmental movements today not because they think the earth is so important, but because they think it's fashionable to do so.) doesn't mean that it's wrong to be environmental. I think a lot of Christians decide not to be involved in environmental issues for the exact reason that you stated. But if we use that kind of reasoning, then I think you could also say that we shouldn't be pro education because a lot of people think that knowledge leads to salvation (gnosticism). Just because other people do the right thing for what you would say are the wrong reasons, doesn't mean that we shouldn't do the right thing for the right reasons. The authors, in fact, go into great detail on that in this book. One of the first commands that God ever gave to mankind was to "tend the garden." I think we fail as stewards if we avoid that command simply because others who aren't following God are doing a better job on that command than we are. I think the converse is actually true: Many Christians use the "worshiping the environment" argument as an excuse to ignore stewardship of it. Environmental issues are complex and difficult to understand. If we take the ultimate approach it involves a reasonable change of lifestyle. Many Christians seem unable to accept that guidance on their lifestyle can come from any source other than the bible, even though in reality we take leads on such things from all manner of different sources. In any case, whatever our views on origins, it's fair to note that our environment has existed from before the time that people were on the earth, and in that respect it certainly deserves some degree of reverence. Why is it so few of today's christians get this? I refer to the last clause. Our first job was to take care of the Earth, to dress it and to keep it. We were never fired from it. Perhaps we should have been, since we're so bad at it at times. Very interesting post Meg. We must treasure what the creator has given us. It is sad how some destroy what is given in love.